Dewalt brand has become a popular name among power tool users. The company’s power tools such as their routers are highly rated by consumers owing to their performance, design, durability, and functionality. Dewalt DW618PK is an embodiment of all the features for which the product of this brand is known for. It is designed for both plunge and fixed base routing. This model of router is a very good option for beginners as it comes with built-in features that are user-friendly. However, there are also some features of the product which advanced and intermediate woodworkers will find very helpful. Read on to know more about this product, its features, pros, and cons. This is the quality wood router for sale. DW618PK is a combo kit which features 12 Amp motor which can generate a horsepower of 2-1/4. The motor’s housing is made of metal material. The motor spins at a variable speed of between 8,000 and 24,000. From its trigger, you can select the right speed suitable for the type of items you are working on. The speed dial provides users with 6 options. For a speed range of 8,000 to 14,000 RPM, the dial should be set between 1 and 3 while for a speed range of 18, 000 to 24,000 RPM, the dial should be set between 4 and 6. But operators are also able to set the router at a constant speed due to the fact that it utilizes a complete electronic feedback. This Dewalt combo kit comes with plunge and fixed bases. The former comes with adjustable five-position which comes handy when plunge cuts are being made. The latter on the other hand has a micro-fine depth adjustment with which the bit adjustments can be achieved in 1/64 inch increment. If the router is mounted on a table, a constant switch power cord location has to be sustained because the bit depth adjustment is effected at the turning of the ring and not the motor. The base is sturdy and provides maximum bit visibility thanks to the clear, Lexan sub-base that it comes with. The base can also be fitted with standard template guide bushings to simplify the setting up of application specific. The router also comes with a sub-base concentricity gauge which makes it possible for the user to place the sub-base at the center in relation to the location of the bit when it is inserted into the collet before installation. The switch of a router is well sealed to prevent dust from entering into it. In this way, the switch will last longer for the user. The plunge base has a case-hardened steel guide as well as precision-machined brass bushings which enhances the durability and consistency of the machine. This best mini wood router comes with rubberized handles that do not cause hand fatigue even after many hours of use. Besides, the handles offer a perfect grip. A vacuum can be fitted to this model of a Dewalt router and still the operator’s line of sight will not be obstructed. The power cord can be detached and this makes the servicing of the machine to be very easy. It is very easy and comfortable to use thanks to a wide range of comfort features it has. It is a good value for money considering its performance and functionality. It comes with a built-in dust collector. It is a versatile router as it can be used for the plunge and fixed base routing. Besides, It accepts different sizes of collets and can be mounted on a table. With its weight, it may be difficult for some woodworkers to use it to work for hours. Besides, it reduces the portability and flexibility of the product. The centering tool has to be purchased differently meaning that extra fund has to be spent on the purchase. DW618PK is a value for money and this explains why it is well rated by consumers. 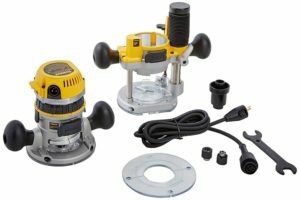 It is not a good option for people on budget or people looking for the small wood router for work around the house or for lightweight projects. The router delivers the good power required for a difficult task. If you have not used a router before, this product may be an option for you.